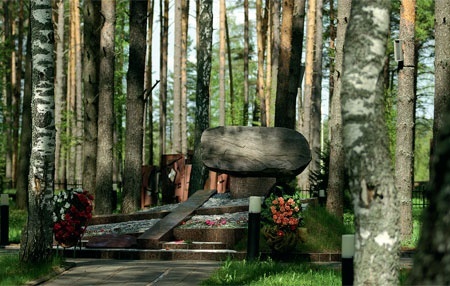 On Stalin’s orders, the 6,000 Polish POWs buried near Mednoye were shot in a soundproof room at the rate of 250 per night for nearly a month, stopping only for the May Day holiday. With summer here, it’s a good time to get out of the city and enjoy some of the cool pine and birch forests around Moscow. Recently, I did just this, bringing my bicycle on a suburban train (known in Russia as elektrichka) and heading for the small village of Mednoye, near the city of Tver. Mednoye is the final resting place of about 6,000 Polish soldiers aft er they were shot by Soviet authorities in the spring of 1940, at the same time as the more famous massacre at Katyn. Six stops north of Tver on the St. Petersburg line, I got off at little wayside halt called Kulitskaya. Crossing the railway line, it was not hard to see which way to go: A wide dirt road ran through fields and rich forest. It was along this road that the Soviet 29th Army retreated in October 1941 to parry the German thrust beyond Kalinin, as Tver was then called. The river down to my left was the furthest point the Wehrmacht reached. 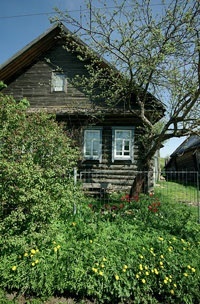 Today the mainly log-built houses look peaceful and calm, surrounded by their usually well-kept gardens of flowers, vegetables, and fruit trees. 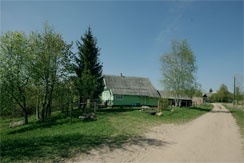 The sight of several large new houses with foreign cars parked outside was a sign that prosperity has reached this town in the heart of Tverskaya Oblast. After the first 10 kilometers of unpaved road, the appearance of a hard surface made cycling much easier, though riders should look out for deep potholes. The good news is that the drivers, without exception, gave me a wide berth (in sharp contrast to the treatment cyclists usually receive in Moscow). Beside the Tvertsa River, there were holiday camps, picnickers, and even a rather smart-looking hotel, inexplicably called the Computer Hotel. This was close to the cemetery I had come to see and in the middle of what used to be the dacha area for the local NKVD. The site — a gorgeous spot on the banks of the river amid a stately pine forest — was presumably chosen for the mass graves because it would have been guarded and therefore not visited by ordinary citizens. The story of the massacres of the Poles is one of the ugliest in the long history of Soviet bloodthirstiness. Put briefly: When Germany invaded Poland from the west in September 1939, the Soviet Union moved on the country from the east, taking control of the territory up to a demarcation line agreed upon by the Soviet and Nazi foreign ministers in the Molotov-Ribbentrop Pact of August 1939. The Poles fought the Germans ferociously but did not resist the Soviets, imagining that they were arriving to prevent a Nazi occupation of the whole of Poland. Two hundred fifty thousand Poles walked into captivity, completely unaware of the fate in store for them. Most were quickly released by the Soviets, but military offi cers, along with members of the intelligentsia, many of whom had been conscripted at the outbreak of war, were retained in NKVD-run camps. For six months, Stalin, Beria, and others debated what to do with them. Beria is said to have wanted to keep them alive for possible use in the event of a German invasion of the Soviet Union, as they would provide a cadre of experienced officers whose hatred of Germany matched that of most Soviet patriots. The distrustful Stalin, however, decided that the Poles were more of a danger to the workers’ state than a potential military asset. So, with the agreement of most of his Politburo colleagues, he ordered the murder of the 22,000 Poles. Most of these were held in a camp near Kharkov in Ukraine, while 4,000 of the most senior officers were imprisoned near Katyn, where the German army discovered their graves in 1943. The 6,000 Poles buried near Mednoye were mostly policemen, intelligence officers, civil servants, land-owners, and professionals. They had been held at the Nilov Monastery near Ostashkov until April 1940, when they were led out to waiting trucks with the promise that their cases were going to be individually examined. They were taken to NKVD headquarters in Kalinin, where they were shot in a soundproof room at the rate of 250 per night for nearly a month, stopping only for the May Day holiday. Their bodies were buried in mass graves near Mednoye. The banks of the Tvertsa River, which flows through the village of Mednoye. The river marked the furthest limit of German advance in the autumn of 1941. 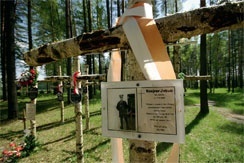 Today the site is a military cemetery and museum, built and run by the Polish government. The bodies of the victims were exhumed in the 1990s and reburied in consecrated ground 100 yards from the original pits, the mounds over which can still be seen among the pine tress planted to disguise the site. By road: Take the M10, Leningrad Highway through Klin and Tver. Thirty kilometers beyond Tver, a new road branches off from the old one. Continue on the old road through Mednoye and then another 2 kilometers until you see a sign for Mednoye/Yamok. A good road, clearly signposted, leads another 2 kilometers directly to the site. 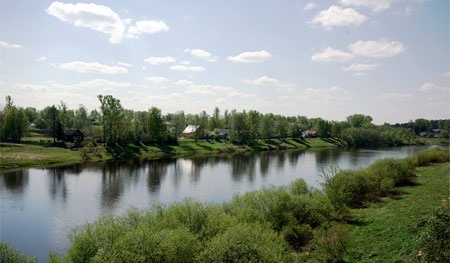 By bicycle: Take the train from Leningrad Station to Tver. Change to the train for Bologoye and get off at Kulitskaya. Cross the line and cycle about 16 kilometers to Mednoye and turn right at the old main Leningrad Highway, then continue for another 4 kilometers as above.